Naming Rights Moda Health purchased naming rights to the new arena for 10 years for an undisclosed amount. 1992-1995 - Attendance for Portland Memorial Coliseum. Designed by the architectural firm Ellerbe Becket, Kansas City, the total enclosed area of the Rose Garden is over 785,000 SF on eight primary levels. Five levels are open to the public during events. The general public will use two major concourses, the 100 Level (Main Concourse), and the 300 Level (Upper Concourse), along with a portion of the Event Level. Sandwiched between the 100 and 300 Levels are the 200 Level (Preferred), and the Suite Level. The Rose Garden is a flexible, multi-purpose facility hosting a variety of events including NBA and college basketball, professional hockey, indoor soccer, indoor track & field, gymnastics, major concerts, monster truck rallies, rodeo and bull riding, circuses, ice shows, boxing, "professional" wrestling, and convention and trade shows. Total capacity for NBA Basketball will be over 21,300. Patrons of the two major concourses and the Event Level public spaces will be served by 19 concession stands comprising the following nine themes: The Blaze: Flame Broiled Burgers, The Flying Wok: Anti Gravity Asian Cuisine, Houndogs: Viva Las Hot Dogs, Bridgetown Cantina and Truck Stop, Rosies Frying Circus, Meschugenah Mamas: New York Style Deli, I Scream: So Good Its Scary, Arena Roma: Italian Food Worth Fighting For, and Havanas: Cigars, Wines, Espresso. Coined "Food TV," menus at these stands will be displayed on video monitors via laser disc players located in a centralized Event Level computer room. Over 650 televisions are used within the Rose Garden's concourses, restaurants, clubs, suites, and network of back-of-house areas. Thirty-two public restrooms on four arena levels make the Rose Garden among the most "bladder friendly" facility of its kind in the world. In response to demand, the total number of women's water closets will out number those allocated to men by nearly three to one. Located on the 200 Level is the Rotunda Sports Bar, the Rose Room (executive banquet facility), a lounge with a buffet-style restaurant, a concession stand, a grill, and three outdoor terraces (two smoking and one non-smoking). Seventy luxury suites wrap an entire arena level, midway between the lower and upper seating tiers. Each suite has a capacity of 22 persons and includes a wet bar, catered food service, a restroom and changing area, three televisions (two 31" monitors behind the wet bar and a 10" monitor in the restroom), and a stereo system. Located in the depths of the Rose Garden's Event Level, the Command Center is the "eyes, ears, and brain" of the Rose Quarter. This high-tech room controls Rose Quarter and Commons lighting and sound systems, monitors security for the Rose Quarter and Rose Garden, monitors and assists in Rose Quarter traffic control, monitors and controls Rose Garden building/engineering systems, and monitors and controls the Rose Garden fire alarm system. The highest point of the Rose Garden's 210,000 square foot roof is 140 feet above the ice-floor slab at the Event Level. The bottom chords of the roof trusses are 107 feet above the ice-floor slab. Within the roof structure is a network of catwalks totaling 3,100 lineal feet. Span of the primary trusses at the widest point is 343 feet. Suspended above the event floor is a feature found in no other multi-functional arena in the world: the Acoustical Cloud. Comprising eight rows of 20 panels for a total of 160 panels, the Cloud will allow for customized acoustical treatments of the arena interior to correspond with the specific event or show-type requirements. Each rotating 10 foot by 10 foot square panel has a hard and a soft side. For an event where many loud reverberations are desired, such as a basketball game, the hard panel surface would face downward toward the event action and crowd, reflecting noise back to its source. During events where acoustical control and overall sound quality must be at a premium, such as a concert, the soft panel surface would face downward absorbing extraneous sound. * 63,000 connection bolts at the structural steel. * 13,645 square feet of steel louvers. * 88,500 square feet of concrete masonry walls. (From the Portland International Airport) Take Airport Way to Hwy 205 South. Exit 1-84 West, proceed to I-5 North and take the Broadway-Weidler/Rose Quarter exit. Take a left at the second traffic light onto Broadway. Follow Rose Quarter sign to the Rose Garden. April 1, 2001 - From the midst of the Rose Quarter near the banks of the Willamette River opposite of downtown Portland, the Rose Garden in person appears to be just attractive in person as its name would suggest. 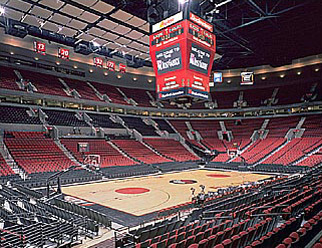 Opened in 1995 to replace the undersized and outdated Memorial Coliseum, the Rose Garden is one of the finer new buildings in sports and deservedly so for the people in Portland who rank amongst the NBA's most rabid and loyal fans in the game. The Rose Garden is the main component of the Rose Quarter complex which consists of the Rose Garden at one end, and its predecessor Memorial Coliseum at the other end. Sitting right in the center of this complex, between the Coliseum and the Garden is One Center Court, a shopping and entertainment complex that houses a brewery, an Italian restaurant, the Blazers team store, and the ticket offices for both arenas. Several parking ramps abut the arena, including one built right into the building similar to the configuration at our own HSBC Arena. A short block away is a light rail rapid transit station. In the area separating the Garden from the rest of the complex there is a large and attractive public plaza, complete with benches and tables, where people can hang out before and after games. Near the main entrance there is a fountain area with two columns in the middle, each one with a flame atop of it. Like other new arenas this building has wide concourses for anyone to navigate through with their soda and that special Blazer souvenir. Just about everything else we saw was truly extraordinary here. To start, the color scheme in this building was amongst the best we have seen everywhere. With red and black and white everywhere make no mistake you are at the home of the Blazers. All signage, floor tiles, accents, trim and even the escalator stairs are done in team colors. No detail was spared. This had us wishing that our very own HSBC Arena would have picked up on that. The concourses also have their fair share of historical memorabilia. Along the walls one can see the names and faces of persons in the Blazers Hall of Fame. Icons such Walton, Lucas and Buffalo's still revered Dr. Jack Ramsay adorned the building. Not to mention the old banners from Memorial Coliseum celebrating their magic moments and great players. If during the course of the game you need to leave your seat, there is probably no better place than here to follow the action from the concourses. At many spots in the concourses you will see a fully functioning scoreboard that keeps tab of time and score, along with several monitors with each one that not only show the action on the court but also NBA.com TV along with other games in progress. There are three huge sculptures sponsored by advertisers such as Panasonic and Coca-Cola, all with banks of TV monitors showing out of town games. Also, from the upper concourses one can walk outside onto balconies which offer differing perspectives of Portland. Like many new places there is plenty to eat and drink here. 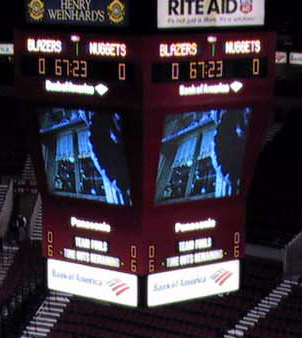 Unlike any places we've seen, here at the Rose Garden they use monitors to show the menu at most concession stands. Those backlit concession menu panels are old style here in Portland. This is a two level bowl with seats for over 20,000. Despite the size of the building, the bowl still retains a sense of intimacy, unlike places such as the Molson Centre which are huge and barnlike. Between the two levels is the suite level and the club level is at the upper half of the lower sideline seats. There are also a few super suites atop the seating area in one corner of the building which provides a nice, if not distant view of the action. Back when this arena opened up in '95 it introduced a new trend in advertising in which there would be simultaneous scrolling ad panels around the entire circumference of the bowl. It's a design that has been copied by many other arenas and though the next wave of technology is already making this passe, it still adds a nice touch. If you are an information maniac and need to know every stat possible about the event on the floor then this is the arena for you. High above the seating area there are not one but several stat boards that keep track of every bit of info a fan may ever want. One at each end keeps track of individual player (all of them, not just ones on the floor) stats for each team. Another stat board (The Hustle Board) keeps track of both teams intangible stats such as blocks, steals, and rebounds. Still another one(Sizzle/Fizzle) tracks positive and negative stats i.e. made FT's, missed FT's. The information here is all concise, non-confusing and well organized. Due to all of the stat boards on the baselines the Blazers hang their banners from the sidelines. At one sideline are the individual banners for Walton, Lucas, Petrie, Ramsay and others along with the most recent addition Clyde Drexler. Above the other sideline are the team banners for the division and conference championship banners along with the 1977 NBA Championship Banner. Definitely their shining moment of glory. This is a team that is about to enter the playoffs for the 19th consecutive season so you can see that there is plenty of tradition here. The Blazers have their pre and post game radio show studio in the team store at One Center Court. Peter had the chance to go on the air and say a few words about our odyssey. Also of note, on the wall outside the Garden there is a plaque with all of the names of the workers who built this magnificent arena...nice touch!! Absolutely spectacular!!!! In a nutshell, probably the finest NBA arena outside of Indianapolis. 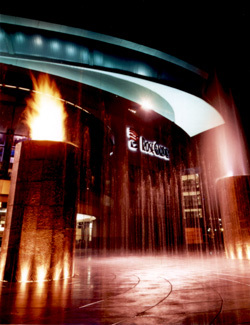 Both Andrew and Peter voted to add this arena to the top of our "five star guide" list for our NBA venues. We would come back here anytime! Special thanks go to KPAM Radio, including Andy Young Producer and Dwight Jaynes Host, for having us on the Dwight Jaynes show on the previous Friday and for setting us up with a pair of ducats for the game. Also a shout to the Blazer post game show, Mike Barrett, Blazer Broadccaster, and David Barberis and Rich Patterson, Producers, for having us on and for directing us to the East Bank Sports Bar & Saloon...nice choice. The NBA has withdrawn from talks between the Portland Trail Blazers and owners of the Rose Garden arena intended to make the team the building's owner. League officials say the current owners have not been cooperative in the talks. The league said in a statement that it has been trying to package a deal to sell both the basketball team and the Rose Garden to one of several possible buyers as a way of helping the financially ailing franchise owned by billionaire Paul Allen. "Unfortunately, the arena owners have not offered any constructive response to these efforts and recently advised us that they are satisfied with the status quo," the statement said. "Accordingly, we have advised both parties that we have withdrawn from the process." The owners disagree. "While we said we are comfortable with the current situation, we have also made it clear to (NBA Commissioner David) Stern and the Trail Blazers that we are willing to meet to discuss any proposals that they have," said Richard Josephson, a board member for Portland Arena Management, the group that owns the venue. They have met with the league, the NBA team and Allen investment firm Vulcan whenever asked, but a specific proposal was never put forward, he said. In a March 29 letter obtained by The Oregonian newspaper, Stern told the management firm that the league made a "very specific" proposal March 17 that calls for selling the team and arena together, which Stern estimated could fetch $300 million or more. 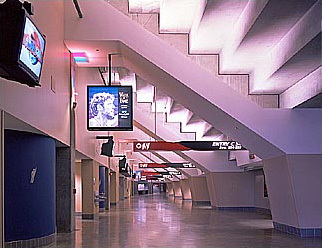 Portland Arena and the team were to split the sale proceeds. Josephson said the league never made a proposal combining such specifics. He said that the $300 million figure was one of several numbers thrown out for discussion over the course of several weeks and that a 50/50 split was discussed in a separate context. In addition, Josephson said, Stern was not part of the March 17 discussion. Allen recently said he would like to see a public/private partnership to keep the team alive. City leaders told Allen not to expect public money. The team's lease runs through 2025 and Allen has said if support is not forthcoming, he could be forced to sell the franchise. Stern has said it may not be possible for the team to remain in Portland, but that it's too early to determine what the future may hold for the team. The primary creditor and member of Portland Arena is TIAA-CREF which holds $193 million in debt loans made to Paul Allen, who also owns the NBA Trail Blazers. Allen created Oregon Arena Corp. to develop and manage the building. Oregon Arena sought bankruptcy protection in February 2005 in an effort to restructure the debt and lower interest payments from the 8.99% originally agreed upon. The creditors opted to take over the building. A new owner for the Portland Trail Blazers may break the impasse between the team and building owners over boosting revenues for the team. Terry Porter, a former Trail Blazer guard, and other investors are considering buying the franchise and trying to work out a deal to buy the Rose Garden from investors who took over the venue after Trail Blazer owner Paul Allen's arena operating firm filed for bankruptcy. The group has already lined up $100 million in debt financing from unnamed lenders but needs to raise an undisclosed amount from local investors, Porter said in a telephone interview with The Oregonian. He declined to specify how much they hope to raise or whom they are approaching. NBA Commissioner David Stern has said that the franchise and arena are worth at least $300 million. 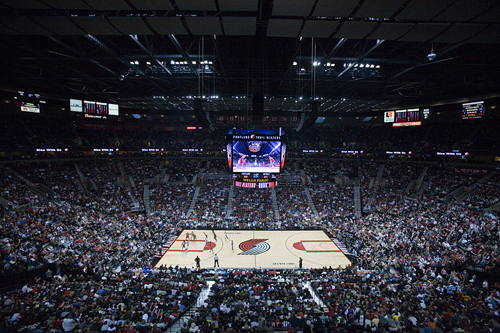 Portland, Ore. - Portland's Rose Garden arena has earned a LEED Gold status, becoming the first major league sports facility to be so recognized. This certification, awarded to the Rose Garden by the U.S. Green Building Council under its Leadership in Energy and Environmental program, identifies and rewards best practices for a building's energy, water and natural resource performance. "We are excited about today's achievement, but understand that the drive for greater energy efficiency and sustainable operations is an ongoing process," said AEG Facilities' Chris Oxley, General Manager of the Rose Quarter. A partial list of the Rose Garden's sustainability initiatives includes: * Recycling: The Rose Garden moves more than 60 percent of its waste away from local landfills, including strategies such as post-event sorting. Extensive recycling stations for visitors and a food-waste composting program with vendors help divert more than 800 tons annually. * Transportation: The Rose Quarter provides many transportation choices, with more than 30 percent of attendees choosing public or alternative transportation. The team subsidizes transit passes for staff and utilizes bikes and electric vehicles for on-site operations. * Energy, Gas and Water: In addition to installing energy efficient lighting and low-flow plumbing fixtures, the Rose Garden partners with Pacific Power and NW Natural for the purchase of 100 percent renewable energy programs for the arena. * Purchasing: The venue's efforts include forging partnerships with suppliers to further develop sustainable purchasing, including more than 95 percent compostable food and beverage serving containers and materials, 100 percent recycled content trash liners, and replacing disposables with re-usable commodities. * Health: The Trail Blazers, AEG Facilities, and Ovations use environmentally friendly cleaning products and equipment, and in keeping with Portland's status as the slow food capital of the U.S., they offer a line of locally made food and beverage alternatives. Larry Miller, President of the Portland Trail Blazers said that the team's fans and Portland community are an important part of the effort to reach its sustainability targets. Portland, Ore. - A redevelopment agreement between the Trail Blazers and the City of Portland for the Rose Quarter could be extended past the Nov. 24 expiration date, The Oregonian reported. The newspaper said talks between the parties are focused on a new project, but the project was not identified. J.E. Isaac, the Blazers' senior vice president for business affairs, told The Oregonian their proposed developer, The Cordish Co., has winnowed its focus and now favors a phased approach. "I'd say it's similar to the original JumpTown concept," Isaac said. "We're focused on a particular parcel and a particular usage. That's what's different. It's specific." Portland Mayor Sam Adams also declined to provide details to the newspaper, but suggested that whatever the two sides are working toward bears little resemblance to JumpTown drawings that Adams previously called "terrible." "They, to their credit, have abandoned that original concept in whole cloth," Adams said. "They've been very open to a different concept. But again, I don't want to negotiate in the newspaper." Public interest in the Rose Quarter exploded last year amid a proposal to tear down Memorial Coliseum and build a new ballpark for the since-departed Portland Beavers minor league baseball team. Adams subsequently formed an advisory committee to plan the coliseum's future, which led to three development finalists, including the Blazers. But Adams this summer told the finalists to consider a joint proposal. Then he pulled the plug entirely, saying a plan for the coliseum should be part of broader Rose Quarter redevelopment. Development rights have belonged to the Blazers since 1993, when team owner Paul Allen's company and the Portland City Council reached a $262 million public-private partnership to build the Rose Garden. 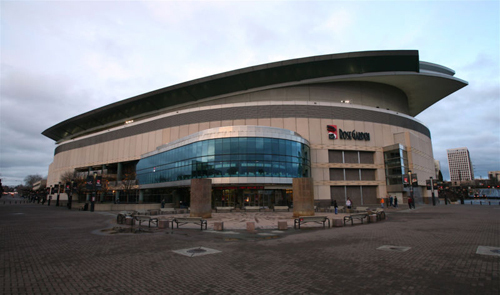 Allen's Portland Arena Management received exclusive rights to propose new buildings on city-owned property in the Rose Quarter through Nov. 24. Portland, Ore. - Last-ditch efforts between the Trail Blazers and Portland leaders to build out the Rose Quarter have fizzled, and a longstanding development agreement will expire in May, officials told The Oregonian. That means no new restaurants, shops or office space will be built on the 40-acre site, at least not at the direction of the Trail Blazers, which have held exclusive development rights since 1992. But the newspaper said that doesn't preclude another developer or company from proposing a project � something officials insist may happen. The Oregonian said the Blazers, facing a May 24 deadline, have been unable to put together a development proposal. The original agreement was set to expire last November, but team officials earned a six-month extension. City redevelopment officials promised "something that's real in terms of both project and financing" by May. But rather than dwell on that, city and team officials suggested that another project could be in the works. They declined to disclose specifics to the newspaper. "I think it's more good news than bad," said Scott Andrews, chairman of the Portland Development Commission, the city's urban renewal agency, which is involved in negotiations. Andrews told The Oregonian city officials were ready six months ago to let the Blazers' rights expire. But the team had a company willing to invest big money, he said, prompting the Portland City Council to prolong discussions. Now, Andrews said, it's possible the unnamed company could still invest without Blazers' involvement. Rose Quarter redevelopment has been back in the spotlight since 2009. After plans to tear down the Memorial Coliseum to build a ballpark collapsed, Adams created an advisory committee to come up with ideas. The Blazers proposed an entertainment district with a Nike museum. Blazers President Larry Miller is a former Nike executive. And Mayor Sam Adams has said he wants Rose Quarter development tied to athletic and outdoor industry jobs. Andrews said the city doesn't have a time line to hear back from the mystery company, although he suggested one to six months. Miller, describing the team as a facilitator, said: "I believe we're closer today than at any point." Plans to develop land next to the coliseum have been in the works since the city and the Blazers' owner, Paul Allen, agreed to build the Rose Garden and new parking garages for $262 million. The Oregonian said the city contributed only a fraction of the cost, and Allen's company received rights to manage the coliseum and propose buildings in the Rose Quarter. A team official recently told the Oregonian there was no proposal. Now, Andrews and Miller said, both sides have agreed to let the development rights expire.